And it's Whitlock in 3! We had a great final match today, even thought it went three straight for top seed Emily Whitlock over second seed Nicolette Fernandes, the match was close to an hour. The first rally of the match sent a definite tone of how the match was going to be played. It was a major rally to start off the match with over 50 shots in the rally, before Whitlock made what would be her worst error of the match. It would also prove to be one of the few errors she would make in the match. Emily ran out to a comfortable lead in the first game before Nicolette made a late charge. However Whitlock’s lead was too much to overcome and she took the opener 11-8. The leg burning rallies continued on in the 2nd game. Each rally seemed to be more grueling with the next. Several of the rallies from the crowd to it’s feet and the girls barely able to stay on theirs. Fernandes managed to put in a few volley short winners but Whitlock’s determination to run down everything proved too much as she took a two game lead. Long rallies continued in the third with both girls making some unbelievable gets that must have punished the legs. In the end Whitlock’s consistency proved too much for Fernandes as Whitlock takes home her first Winnipeg Winter Club Championship. 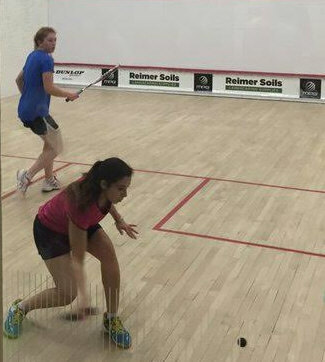 Nicolette Fernandes continued her fine form today reaching her second consecutive Canadian final on the PSA tour. Fernandes took an early 5-1 lead in the first game and never trailed throughout. Fernandes was able to implement her game style on the hard hitting Naughton. Fernandes clearly wanted to play a controlled game and not let Naughton play her power game. Fernandes kept the length tight and used a nice variety of high soft lobs and two wall offensive boasts to great effect. 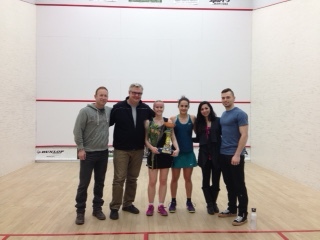 The lobs helped to counter the power game and offensive boasts wore down the legs and helped take Nicolette in to her first Winnipeg Winter Club Women's Open final. 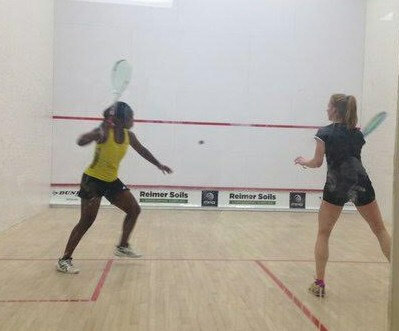 The second semi final of the day was a battle between two English women. The match last a little over an hour for four games. The match featured several long hard rallies with both players able to apply plenty of pressure with volley drops and offensive boasts. After dropping the opening game the top seed seemed to be in control of the second before Moverely went on a run to take over the lead before Whitlock was able to right the ship and tie the match at one. 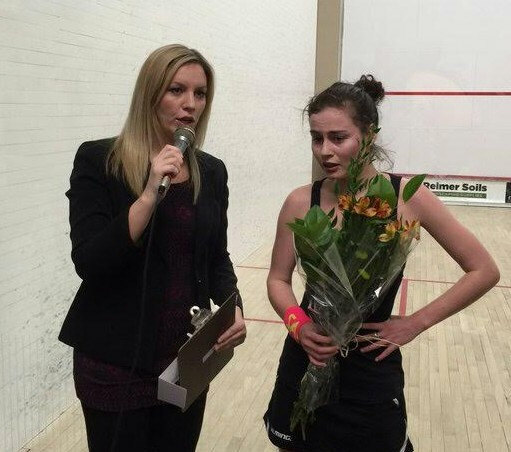 In both the 3rd and 4th long rallies had both players bending over with their hands on their knees, but in the end it was Whitlock who was able to hang in there a little longer and move on to her first Winnipeg Winter Club Women's Open final - and her 14th career PSA title. Nicolette Fernandes continued her fine form here in Winnipeg. Hot of of finals result in Toronto she has now cruised through the first two rounds to make it in to her second WWC Women's Open Semi Final. The frenchwoman, Cyrielle Peltier was never able to put Nicolette under enough pressure to take her out of her comfort zone. Peltier made a valiant attempt to send the match into a fourth game, before Fernandes was able to wrap things up 12-10 in the last. Fiona Moverley is another player in Winnipeg coming off of a good week of play, having pulled of a big win over Jenny Duncalf last week in Toronto. Moverley and El Torky split the first two games which were long and hard. However as the third and fourth wore on it was Moverley who was able to apply more pressure though volleys and tight front court drops. Moverley moves on to set up one half of an english semi final. Hollie Naughton and Danielle Letourneau did battle in an all Canadian affair. There was a lot of hype amongst the fans and players alike for this match between the two long time rivals. The match featured a number of runs which started with Hollie in the first game taking a big lead which she would hold on to and cruise to a one game lead. The second game was pivotal as Danielle raced out to a large early lead and looked to be only minutes from tying up the match at one, before Hollie went on another run. Down 7-2 she mounted a large come back which would see her edge it out 11-9, giving her a two game lead. Danielle did manage to look like she might make a real match of it by winning the third, but not was determined to up the pace and intensity in the fourth which on this day was just a little too much for Letourneau to handle. 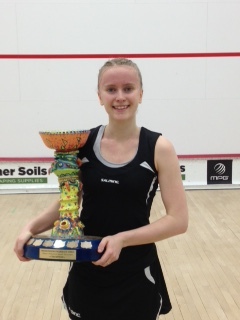 She arrived last Sunday but the top seed had to wait until the last match of the night on Quarter Final night to make her debut at the tournament after receiving a walk over in the opening round. It didn't seem to effect Whitlock's form was overall she cruised to a comfortable victory over former crowd favorite and former local Nikki Todd. 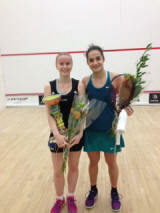 The tournament's second seed proved much too steady for young up and coming Canadian Anika Alexander. Fernandes dominated the early play of the match, giving the youngster no free points. Anika eventually settled in as she realized how hard it was going to be win points. However the steadiness of the tour vet was too much for the hot and cold play of the local as Nicolette moves on the quarter finals with a comfortable victory. Cyrielle Peltier looked smooth and comfortable in her movement and game tonight against the South African Cheyna Tucker. Cyrielle was able to do most things just a little bit better today which resulted in the three game victory. Her length slightly tighter, her errors fewer and her movement more effortless than that of Tucker on this evening setting up a quarter final class with Fernandes. 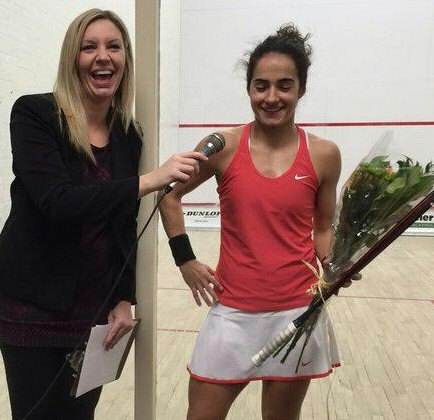 Nouran El Torky picked up on her sisters winning ways here in Winnipeg. 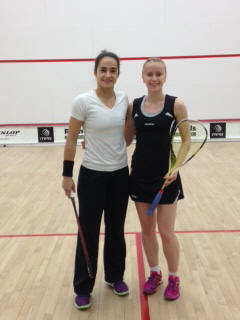 Sister, Heba is a two time finalist here in Winnipeg and Nouran will be hoping to match or improve on that this weekend. 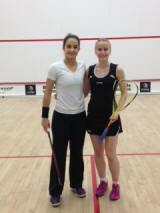 She was up against the impressive youngster from England Gina Kennedy. Despite a three game victory for El Torky this was a competitive match throughout, as Kennedy showed lots of promise for the future. Both players made some impressive retrieving gets upfront in full stretch matching each other drop for drop which had the crowd on the edge of their seats. Toward the end of each game, El Torky's experience helped her to victory. Hot off the heels of her victory last week at the Liberty Bell Open, Canadian Danielle Letourneau continued her hot play pulling off the major upset of the #3 seed South African Siyoli Waters. It was Waters who got off to the hot start in this match as she raced out to a 6-1 lead in the first before Letourneau was able to completely turn things around. She clawed her way back in to the first game before taking it 11-8. Danielle raced out to a lead in the second and showed some her great fight and determination but pulled out some beautiful high quality winners. She cruised to an 11-4 second game victory. Waters who started to minimize her errors and make a few more winners to take the third game and make things interesting. However the fourth was a quick start from Danielle who looked at 9-5 like she would cruise to victory before things tightened up a bit at the end. Waters at 9-10 down went for an ill advised offensive boast which clipped the tin putting the Canadian into the quarter finals to set up a highly anticipated match up with Canadian rival Hollie Naughton.